Seaford Christmas Magic Lights Up the Town! On Saturday 2nd December 2017 the town of Seaford lit up when Christmas Magic returned to the town centre for its fourth year running; bigger, better and even more Christmassy! 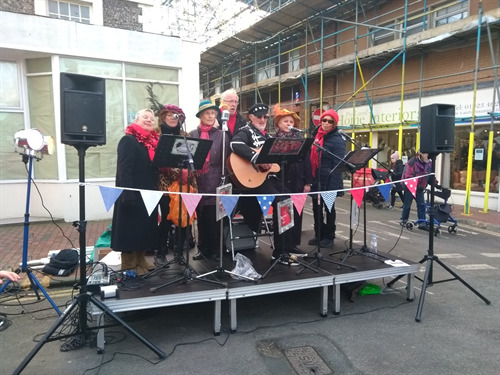 Organised by Seaford Town Council and Seaford Christmas Magic Events Committee, Seaford town centre was filled with the sights and smells of Christmas for all to enjoy. The event was kindly sponsored by many businesses and organisations in and around Seaford, and couldn’t have happened without their support. There were over 40 market stalls providing a vast array of produce, with charity and fundraising stalls, Christmas trees, hog roast, prosecco, mulled wine and a variety of exclusive Christmas goodies; there was something for everyone! Feedback from stall holders was very positive, stating the event was the “best ever”, and local town traders echoing this in that “it’s been a real success”. Seaford saw three stages with live entertainment, which was enjoyed by the crowds who gathered throughout the day to come and support their local talent. Performances were given by Styk, Sam’s Tribute to Sir Elton, Over Sixties Choir, Seaford Choral Society, Julie Terry, Consensus Choir, Ded Effnick, Up the Tempo, SPRuNG, King’s Church, Archway, Harry Kirzynowski, Pop Up Singers, Seaford Vocal Repertoire, and Gerry the Fluter. 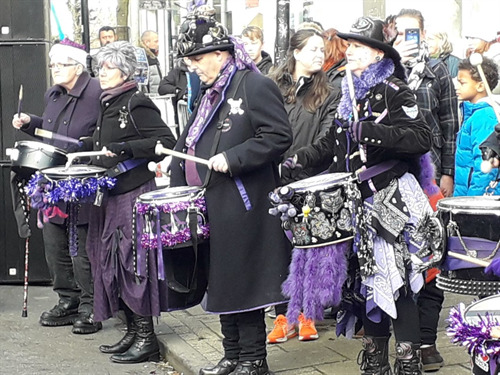 Thanks to the efforts of Jonathan Chappell, responsible for organising the entertainment, an outstanding set of performers kept the town alive with festive rhythm all day long! 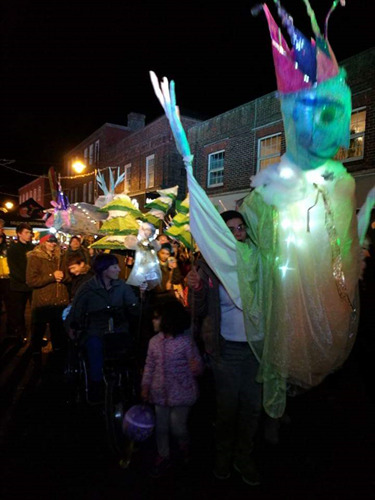 The lantern parade was a magical experience for the families and children who took part and for the bystanders who shared in the joyous atmosphere of the parade. 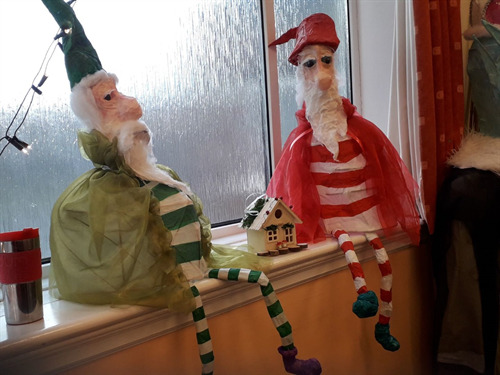 Lantern making in St. Leonard’s Church Hall was made possible by Kristina Veasey and a wonderful team of volunteers, and was sponsored by Phil Boorman House Clearance and Rubbish Clearance Services. Hundreds created their own individual lantern and took part in the majestic lantern parade throughout the town. The wonderful creations from the parade are on display at Seaford Library so do pop along and admire. 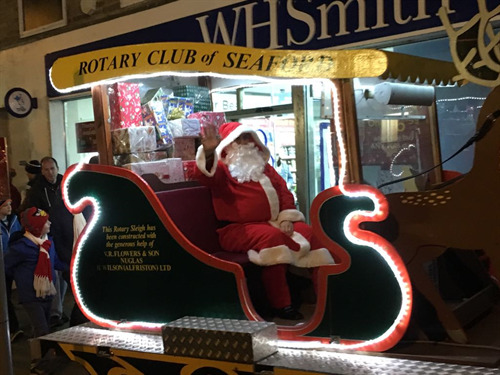 Seaford Town Council would like to thank Seaford Rotary who helped Santa officially mark the start of the festive season with the eagerly awaited switching on of the town’s Christmas lights – a spectacular sight on a dark and crisp winter’s evening for the hundreds who had gathered to join in with the festivities. Seaford Library, Tourist Information Centre, St Leonard’s Church and Seaford Community Cinema also joined in the day and entertained visitors with story times at the Library, mulled wine and minced pies, a full array of indoor entertainment and the movie Wonder Woman shown at Seaford Cinema. Kevin Gordon’s Historic Tea and Tour was very successful and well received, helping to raise money for the Mayor’s Charity Seaford Lifeguards. Seaford Town Council and the Seaford Christmas Magic team would also like to thank the following businesses for their support and sponsorship to the day’s celebrations; Andy Anderson & Son Locksmiths, Toy Town, Sussex Eyecare, Guardswell Cleaning, Reid Briggs Insurance Brokers, David Jordan, SAS Security, Seaford Health Store, VR Flowers, Seaford Home Hardware and The View. Phoenix Medical Services supported the event this year with exceptional first aid cover throughout the day. Volunteers and local business support makes Seaford Christmas Magic and without them, it simply wouldn’t happen. Seaford Bonfire Society provided a full crew of volunteers who not only helped with operational support but truly added a festive cheer to the day! 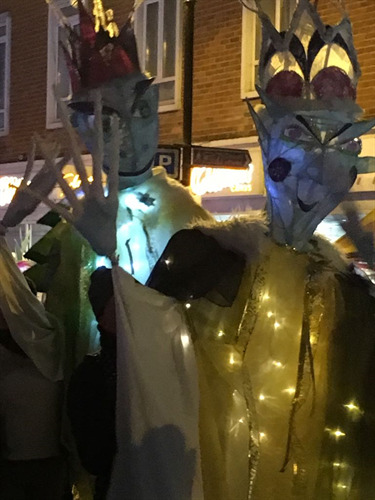 The Town Council hopes all those who visited enjoyed a magical and festive experience, and collectively thank the Seaford Christmas Magic Committee, without whom the event would not have happened: Greg Anderson, Jonathan Chappell, Adam Briggs, Kristina Veasey and Daeron McGee. To all who volunteered their time and efforts to ensure that this event was a success, Seaford Town Council would like to give their warm thanks and a huge well done!